(PhysOrg.com) -- Flow cytometry, a technique for counting and examining cells, bacteria and other microscopic particles, is used routinely in diagnosing disorders, infections and cancers and evaluating the progression of HIV and AIDS. But flow cytometers are big, bulky contraptions that cost tens of thousands of dollars, making them less than ideal for health care in the field or other settings where resources are limited. 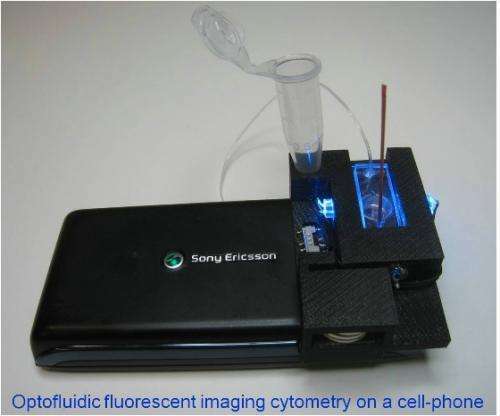 "In this work, we developed a cell phonebased imaging cytometry device with a very simple optical design, which is very cost-effective and easy to operate," said Hongying Zhu, a UCLA Engineering postdoctoral scholar at the BioPhotonics Lab and co-author of the research. "It has great potential to be used in resource-limited regions to help people there improve the quality of their health care." The device is the latest advance by Ozcan's research team, which has developed a number of innovative, scaled-down, cell phonebased technologies that have the potential to transform global health care. Interesting article and, certainly something that has great potential. However, they are not discussing the entire device. Only the disposable part. For example they say: "The sample fluid is delivered continuously through a disposable microfluidic channel via a syringe pump." The last time I bought a syringe pump for precise fluid supply it cost over $1000. Mine was, perhaps, higher pressure, but it leaves me wondering what other parts they did not price in their $5 cost. I agree that this isn't going to be a replacement for high-throughput flow cytometry machines, but it seems that the technology is getting there fast. I also like that with a phone-based platform it can simultaneously provide processing power and communicate the results with a server somewhere. Maybe this will evolve to be the doctor of the 21st century?